A lot has happened in the fields of artificial intelligence and natural language processing since the 1960s. Siri and Cortana, Apple and Microsoft’s virtual assistants, now recognize human commands and offer personal assistance. Less powerful chatbots abound: The airline KLM has created a chatbot to assist clients with flight details while Poncho has built one to serve up weather data to users. And last year, chatbots took the media world by storm. That revolution began when companies like Kik, Telegram, Viber, WeChat and Facebook offered the general public the ability to use their technology to create chatbots. Developers began tapping those APIs – application programming interfaces – and thousands of bots were born. But instead of voice control, most rely on text input. From April until November, more than 32,000 chatbots were submitted to Facebook for review. Paul Bradshaw, a journalist who leads the Multiplatform and Mobile Journalism program at Birmingham City University, says that the term ‘bot’ is normally used in journalism to denote something which users can interact with, an application that delivers updates or answers to questions. But more recently, newsrooms have begun experimented with more ambitious chatbots that interact with users and deliver political news and even recipes. Below, five examples of chatbots recently launched by newsrooms. During the 2016 American presidential election, for example, The Globe and Mail’s GloBot would interact with users on Facebook Messenger, delivering text, graphics, videos and even quiz questions pulled from its website. Since GloBot was only loaded with a limited amount of election-related content, it couldn’t answer just any question. It would only work with specific keywords. Univisión’s Detector de mentiras – or, lie detector – was a game that asked users to guess if sentences uttered by the Presidential candidates were true or false. It was a successful example of a fact-checking chatbot that in a sense gamified the candidates’ stances on issues. 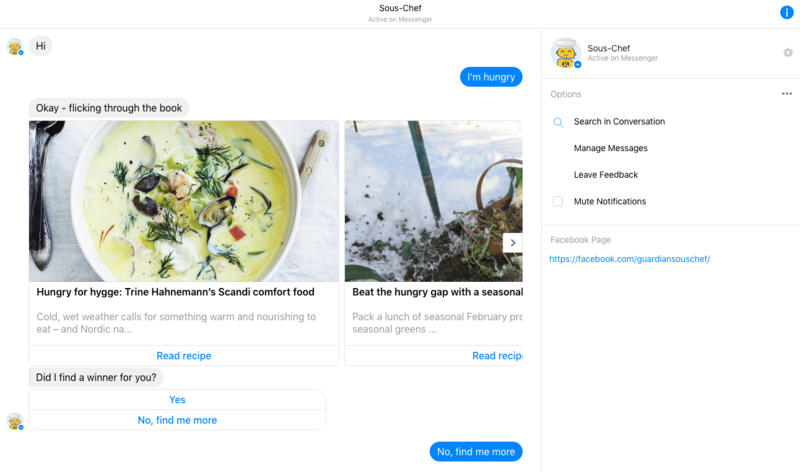 The Guardian built Sous-Chef, a chatbot on Facebook Messenger with a culinary theme. Users Later, the newspaper shared their insights on what worked and what didn’t with the chatbot. The Huffington Post launched a Facebook Messenger chatbot that helps users figure out what to watch on Netflix. The bot, named Felix, asks for user’s preferences and moods and will suggest drama, comedy or random shows.